HTML5 Archives - VIRTUALIZATION IS LIFE! 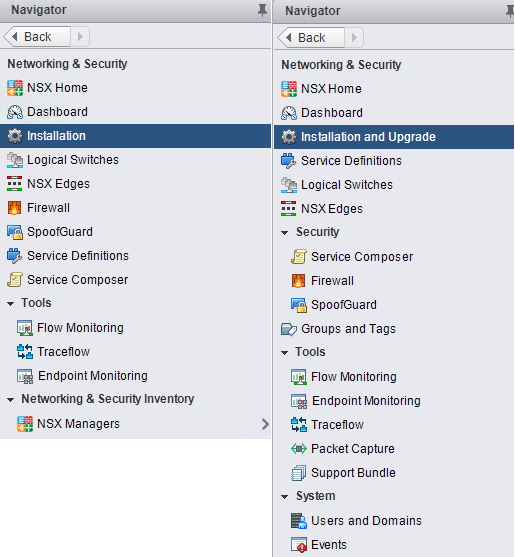 NSX-v 6.4 was released a couple of weeks ago and as I talked about in my launch post, there are a lot of new features and enhancements that make this release significant. A big focus for this release was around enhancing NSX’s ease of use and serviceability. There have been a number of additions to the UI with additional dashboards and menu items. 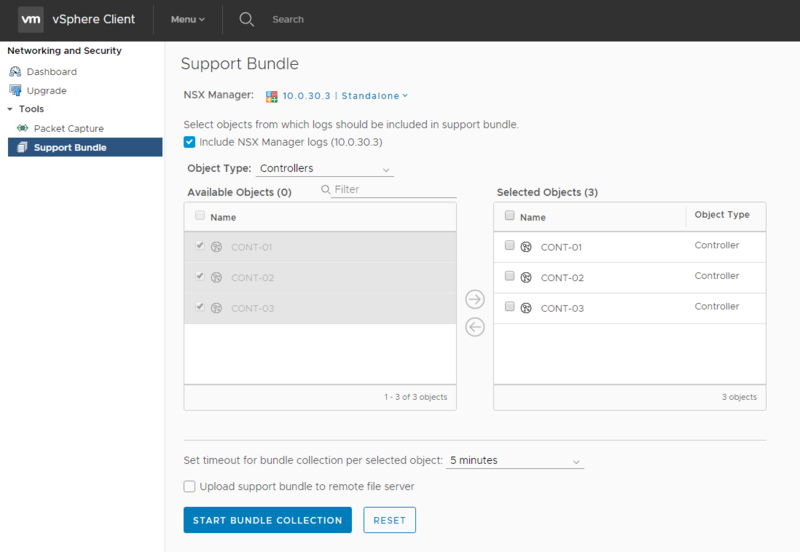 Also importantly, a first port of the NSX Web Client functionality over the to HTML5 Web Client. What’s interesting about the approach that the NSX product team has taken is that they have decided to have each new feature in the HTML5 Web Client accessible from the old Flash based Web Client as well. 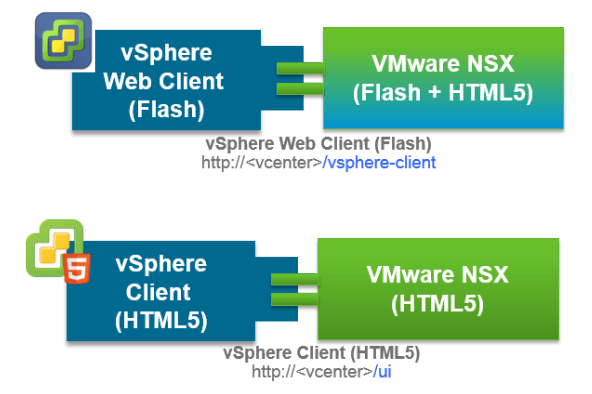 They have also continued to improve on the layout and usability of the flash based vSphere Web Client so what you have now is a combination of Flash and HTML5 inside the old Web Client as well as a limited pure HTML5 NSX experience in the new Web Client. Among the enhancements to the UI is the improvement in the navigation menu where some commonly used menu items that where clicks away have been brought into the main tree. As you can see below there is a lot more happening in the 6.4 menu tree on the right vs the previous releases on the left. The HTML5 menu is a little shorter with only a couple of items added however it shows you what it will look like when the porting is complete. 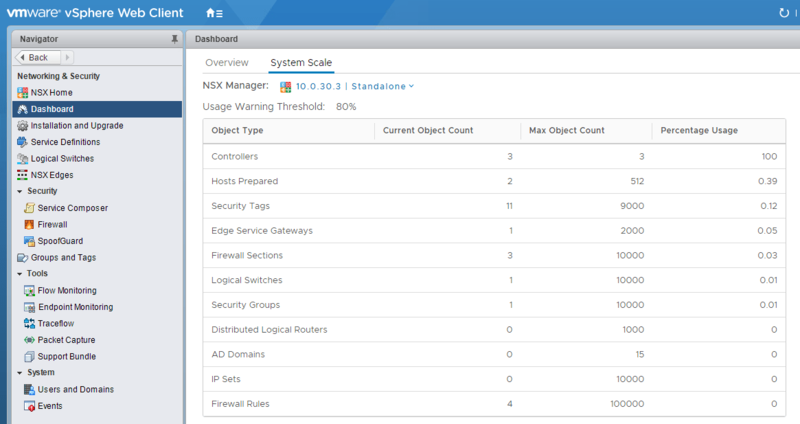 Also shown in the picture below is the new System Scale Dashboard that provides visibility into the current usage of various NSX components and system capacity relative to configuration maximums with warning thresholds configurable. Highlighting the Flash+HTML cross over in the Flash Web Client, the System Scale Dashboard is also present in the old Web Client and shown below. In terms of other UI additions there is now an EAM status monitor in the Host Preparation Tab and a direct way from the Web Client to generate Support Bundle…which again, is available from both Web Clients. 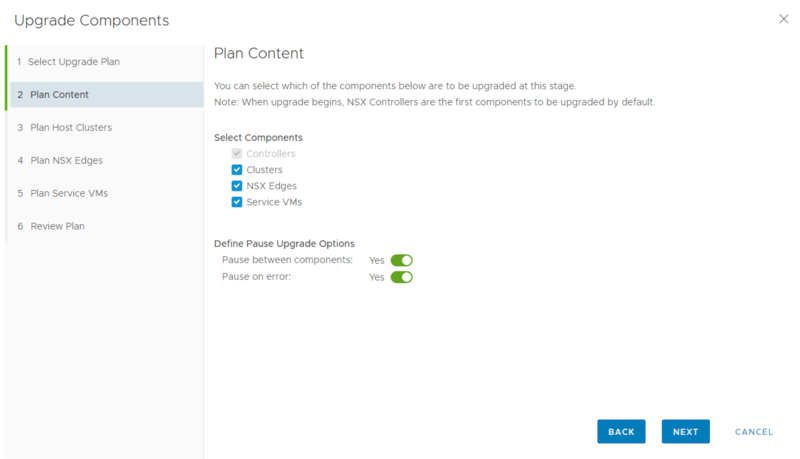 Probably one of the coolest features in NSX-v 6.4 is the Upgrade Coordinator. 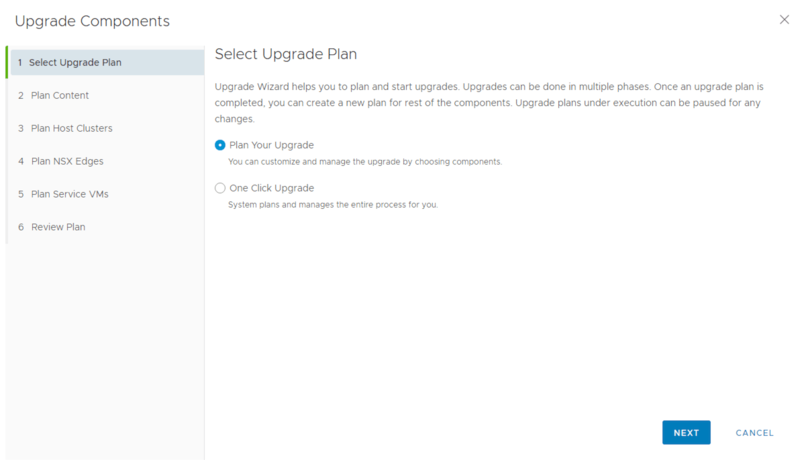 Working you way through the wizard you can select which components to upgrade. 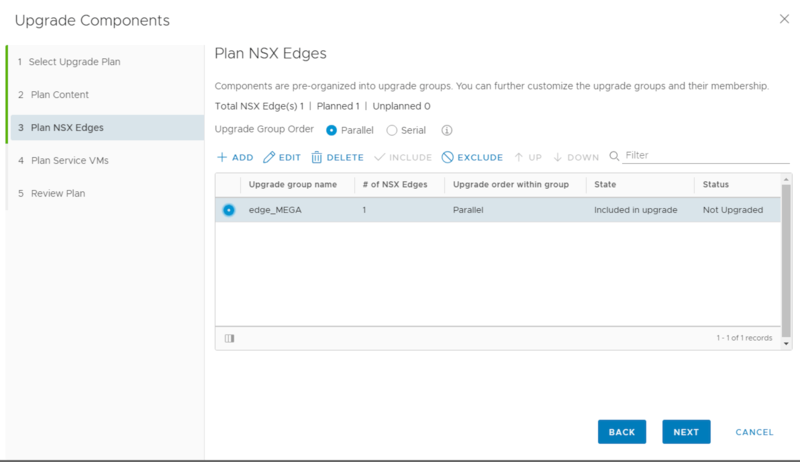 For me have control of the NSX Edge upgrades is super important as this has historically been a monotonous task for Service Providers with lots of customer using vCloud Director Edge services. The Upgrade Coordinator streamlines this upgrade task and makes the process a lot more efficient. Having the ability to group and order the upgrade process for Edges (and Service VMs) is also an excellent enhancement. Once the wizard has been completed you are shown a progress dashboard which you can click into to view the current state of upgrading components. 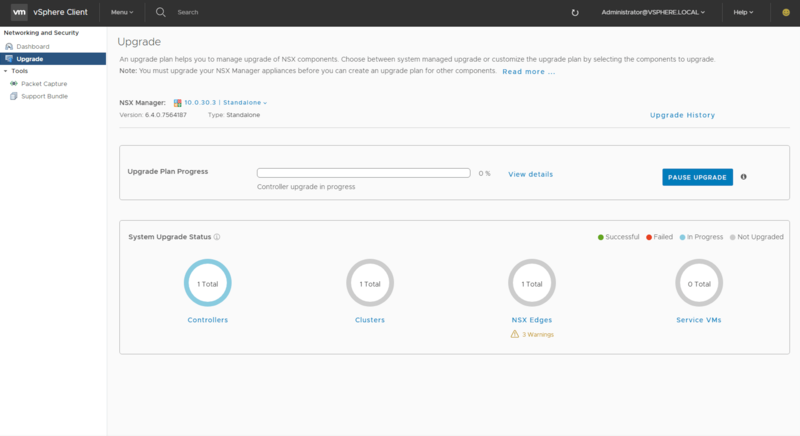 Once completed, you should have all components upgraded and you can go through the post upgrade tasks and once completed you can always get an overview of the NSX environment by clicking on the main dashboard. There is a lot to like about where the NSX team is taking the user interface and it’s good to see an initial move over to the HTML5 Web Client while also having that same functionality still accessible via the Flash Web Client. To have a loot at what is currently supported and what is not in the HTML5 vs Flash Client head to this page and check out the support tables. I’m looking forward to future updates that will look to push more functionality directly into the HTML5 Web Client. 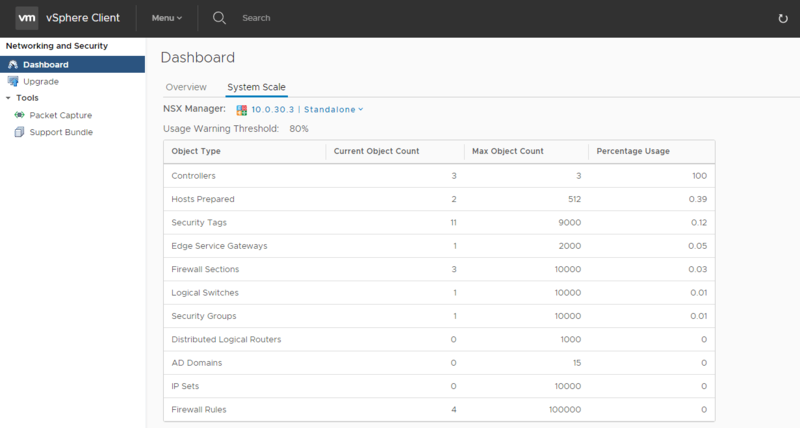 vCloud Director 9.0 was released late last month and brought with it a number of big new features and enhancements. If you are interested in a overview of what’s new, head here to my launch post. Getting back to this post I wanted to focus on what I think is a significant change to the way in which workloads are thought about in vCD…the Standalone VM. Standalone Virtual machines can be instantiated and viewed along with virtual machines as part of a vApp container. A filter button creates a list based on Virtual machines, virtual applications or both. 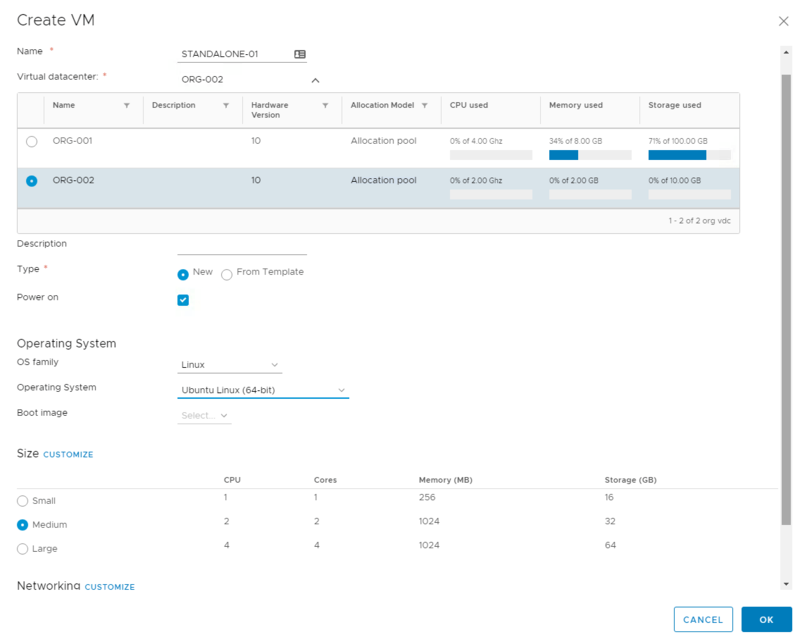 The vApp container construct in vCloud Director carries divided opinion from both services providers and customers of vCD with one side liking the fact that VMs could be grouped into logical vApps and treated as a like group or VMs such as an Exchange Cluster. While others wanted the ability to deploy standalone VMs that where more like VM instances you find in public clouds. Historically from a programatic point of view the creation of a VM within a vApp had it’s challenges in a chicken and egg type of scenario where by the composition and recomposiontion of the VM within the vApp required a specific order. 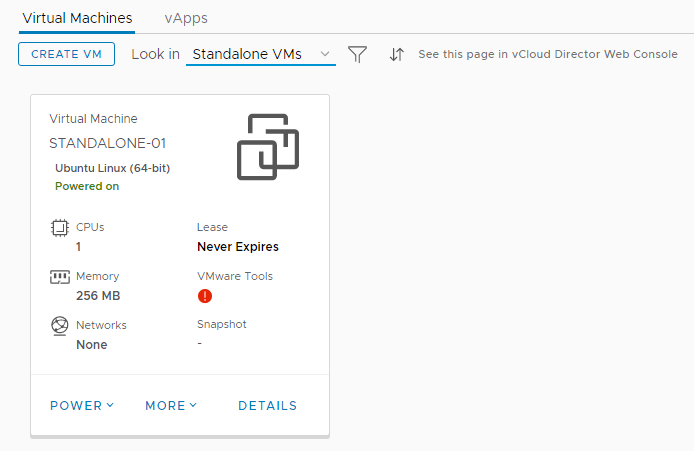 This was improved from 8.0 with enhancements to vApp functionality, including the ability to reconfigure virtual machines within a vApp, and network connectivity and virtual machine capability during vApp instantiation. 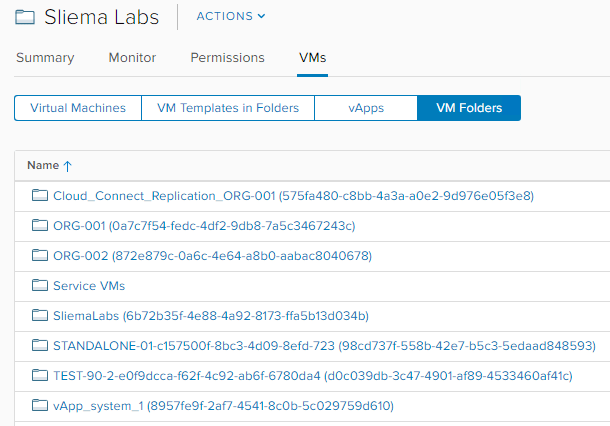 In vCloud Director 9.0 you can now create and configure individual Virtual Machines form the new HTML5 Tenant UI. Under the compute menu you now have a Virtual Machines and vApps tab. From here you can view either standalone VMs, VMs in a vApp or both. This is also where you can create a new VM. Note that you can’t create new vApps from the new UI just yet…that still needs to be done in the Flash based UI. You now have the ability to choose from three pre-canned instance sizes which come with default resources depending on the type of VM selected. However you can still customize the VM as shown below. When provisioned the VM is available from the new tenant UI with all the normal operations possible. The biggest difference here is that you don’t need to worry about the vApp state and that it’s independent from any other VMs. As a side note as it’s not 100% obvious, to view the console of the VM click on the icon top right of the Virtual Machine box. Taking a look under the covers of the HTML5 UI the standalone VMs are represented slightly differently in vCenter. in Previous versions each VM was created with the VM name plus a UUID…when a standalone VM is created the VM name is just that…the VM name. However what is interesting is when you look in the Flash UI you will see that in fact the standalone VM is still contained within a vCD vAPP construct. So in effect, that HTML5 UI is presenting the VM as standalone, but in actual fact there is still a one to one relationship with a vApp under the covers. Taking a look back in vCenter under the folder view it’s more representative of what you see in the Flash UI. Querying the API shows that the Standalone VMs are indeed composed within a traditional vCD vApp.